Careers Cost > How Much Does a Shredding Service Cost? How Much Does a Shredding Service Cost? Shredding services are provided to companies and/or individuals who need their outdated documents and sensitive files destroyed. Since it could take hours or days to shred piles of paper with a household shredder, shredding services can bring in customized trucks or you can bring it to their location to shreds hundreds of papers within minutes on the spot. 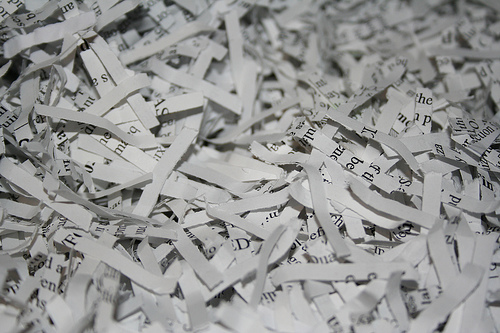 The cost of a shredding service will depend on the amount of paper that needs to be shredded, the company performing the service, geographical location and if you’re on a recurring contract. On average, local franchised services can charge about $1 per pound or $40 to $100 per bin, often the size of a garbage can, if you were to use a commercial service. We researched some of the most popular companies businesses use and provided the quotes we were given in the table below. Angie’s List says the average cost for an on-site visit will be $100 to $150, but if you agree to a recurring visit, the costs can drop to $45 to $75 per visit. - $99 per bin + $40 for each additional to bring to their premises. - $20 to $30 per 50 pounds if you bring to them. - $10 per box if you bring to their location. From our research, if you were to bring in your papers to a retailer such as Staples or Office Depot, it appears that they partner with Iron Mountain for pickups. This being said, your papers won’t be shredded on the spot, but rather, it will be placed in a secure box for a future pickup date. Some companies have hidden fees, on top of the estimates mentioned above. This can include administration fees, late fees, carton retrieval fees or even rush job fees. With this being said, it’s always best to read the fine print before signing any contract. Some companies may have a minimum charge, so it’s best to know what this may be before committing. Bring the documents to the company instead of having them pick it up will always be the cheapest option to consider. Considering looking at purchasing a shredder. This is a great option for those who only want to shred a few papers here and there. A good, quality shredder will start at $50 and go up from there. There are some companies that offer paper recycling and actually pay you rather than charge you. These companies encourage recycling and they will put what looks like a dumpster on the grounds of your business. Papers can be put in this container, and when it is full, call the company for pickup. Although you will not make a large profit on this, it will help the environment by recycling as well as save you money on shredding services. However, this is not a suggestion for those with papers that need to remain confidential. Look for coupons before considering a local franchised chain. For example, at the time of this writing, Office Depot is offering five free pounds of document shredding if you print the coupon off their website. Many communities often hold shred events for free for its residents. As long as you have a valid ID, this is a great way to take advantage of a free service. Check your local government website or search online to see if any events are coming up. You can also search for something along the lines of “free shredding plus your city name” to see if anything pops up.